Cariad Lloyd is a regular face on television these days. She has become a frequent guest on QI during the past few years as well as starring in the likes of Peep Show, Murder in Successville, Crackanory and Crims. But this comic and writer has many strings to her bow. With an aptitude for improvisation, Cariad is animated and engaging, able to endear herself to audiences with ease. She is a member of the highly acclaimed Jane Austen-inspired improvised sketch group Austentatious: The Improvised Novel (fellow cast member Jospeh Morpurgo has been MoodyComedy’s Comedian of the Month in the past). The area of Cariad’s work that I have most recently enjoyed, however, is her relatively new podcast: The Grief Cast. As you might guess from the title, it is a series about dealing with losing a loved one. Cariad, who has personally suffered from such a loss, invites comedians and writers to talk within a lighthearted yet honest and sometimes quite frank discussion about their experiences. Lloyd is empathetic and clearly very emotionally mature, and she supports her fellow comics as they share stories from the most painful parts of their lives. Though, at the same time, The Grief Cast is factual and both interviewer and interviewees don’t muck around when it comes to being blunt yet fair regarding the realities of death and grief. Cariad as a story elicitor is honest but never judgemental. This podcast is quite honestly a pleasure to listen to. You can listen to it here. 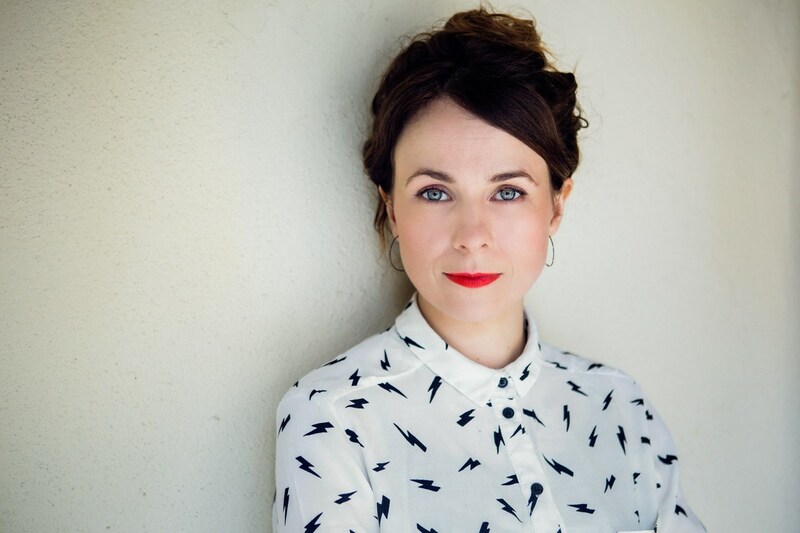 For more information, follow Cariad Lloyd on Twitter or visit her website. Book tickets for Austentatious: The Improvised Novel’s nationwide tour here. It can often be found that the success of a stand up comic originates from an ability to manipulate language in order to convey incredibly specific meaning. This skill is particularly evident in the sketches of this month’s Comedian of the Month, Joseph Morpurgo. Morpurgo is articulate and expressive in his storytelling in such a way that characters are given a great sense of depth. Pair that with a knack for physical dramatism and extravagance and you get what could be deemed a multi-layered, new style of slapstick comedy. While researching this intriguing performer, it was a delight to discover an improvisational comedy group named Austentatious, of which Morpurgo is a co-creator and member. This discovery led me to become more excited about a comedy group than I ever have before; if you search for their trailer online you will see why. In fact, a lot of Joseph Morpurgo’s professional credits come with an element of improvisation, with him working with other comedy groups as well as teaching improv all over the country. Is it any surprise that Joseph Morpurgo leads this year’s group of Chortle nominees? Probably not. With nominations for Breakthrough Act, Best Show (for his 2015 Edinburgh show Soothing Sounds For Baby) and the Award For Innovation (also for Soothing Sounds For Baby), this name will soon be a very recognisable one. If my point needed proving at all, simply note the fact Morpurgo is nominated for an award for innovation in comedy. I think that speaks volumes, as it implies a great respect and genuine passion for the craft to an extent that new and exciting things are being created, and that is what keeps comedy alive. Voting has now closed for this year’s Chortle awards with the award ceremony taking place on March 22nd and Austentatious are currently touring their Improvised Jane Austen Novel around the UK. Click here for more information about Joseph Morpurgo and follow him on Twitter.